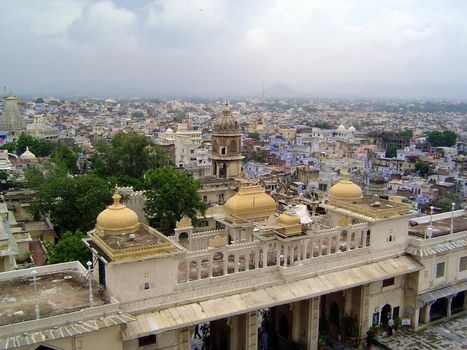 Udaipur has been one of India's major tourist attractions for a long time, perhaps because it was described so favorably by James Fergusson in 1876. Speaking of the juxtaposed city and lake palaces, he wrote that "it would be difficult to find any scene where art and nature are so happily blended together, and produce so fairy-like an effect. Certainly nothing I know of so modern a date equals it." 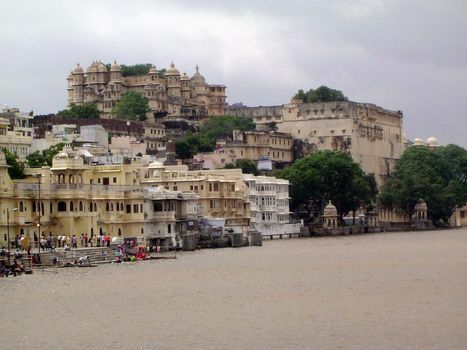 Murray, whose Handbook for Travellers in India... was the standard tourist guide during the British period, relied heavily on Fergusson and described Udaipur as "marvellously picturesque." From there, it's a straight shot to the 21-day package tour. 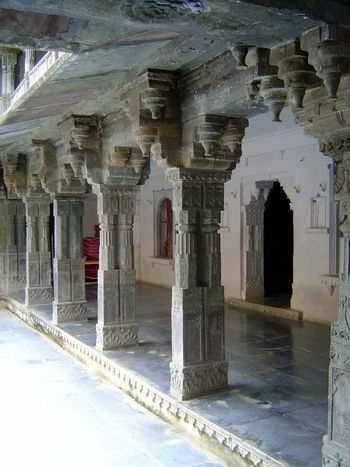 The Mardana Mahal or Entrance Hall to the City Palace. 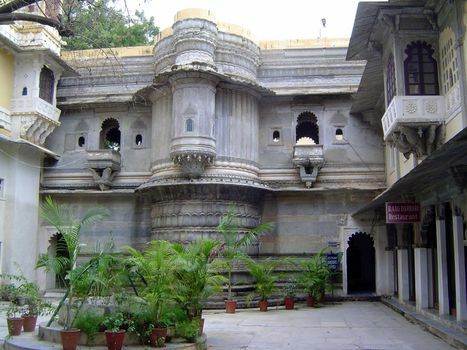 The palace is not as immense as it appears, because it straddles a natural ridge, which fills what would be the center of the building. 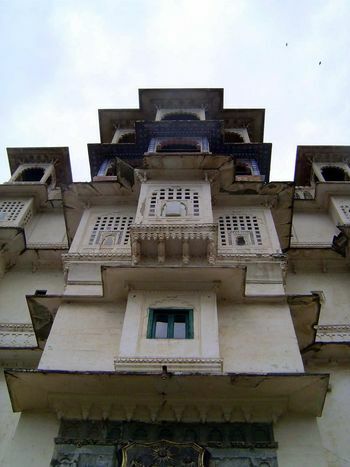 Vertical view of facade over the entrance. 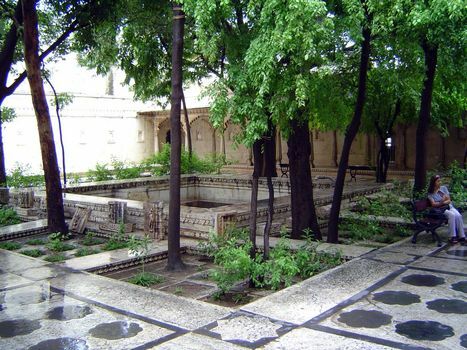 A most surprising garden: the Badi Mahal, built about 1700. It's at the highest point of the palace, yet the trees are rooted in the rock at the very top of the ridge around which the palace is built. The view from near the Badi Mahal. The triple gate or Tripolia leads on the right to the entrance courtyard. 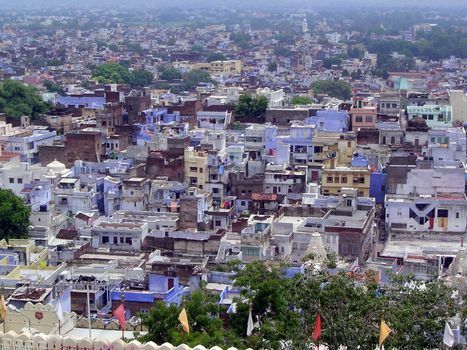 Beyond: the city, with its characteristic though modern purple-blue wash. 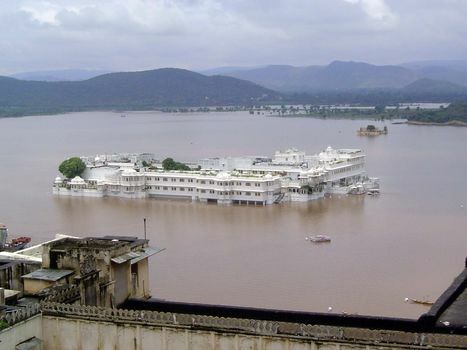 The lakeward view is over the famous Jag Niwas, or Lake Palace, now a hotel run by the Taj chain. The lake is very shallow, and a week before this picture was taken in July, 2005, to the dismay of residents it was entirely dry, its bed a sea of clay plates. 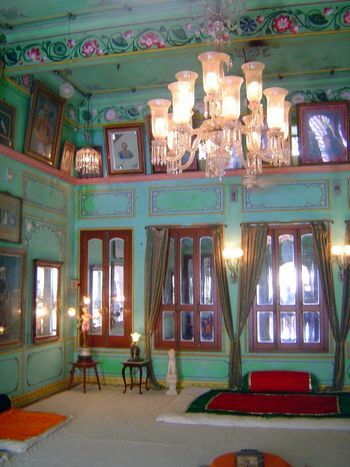 Many of the palace rooms scale not only a rocky ridge but the heights of vulgarity. 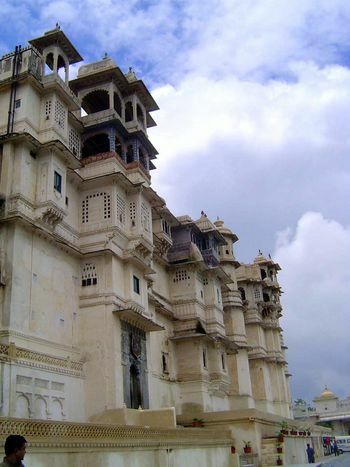 Case in point: the Dil Kusha Mahal, from the 1620s. The name translates as "love entertainment room." 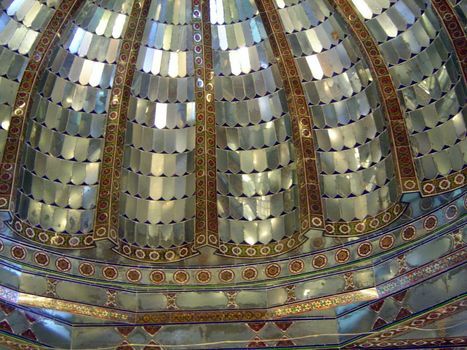 Dome in the ceiling of the Dil Kusha Mahal. The floor is mirrored, too. 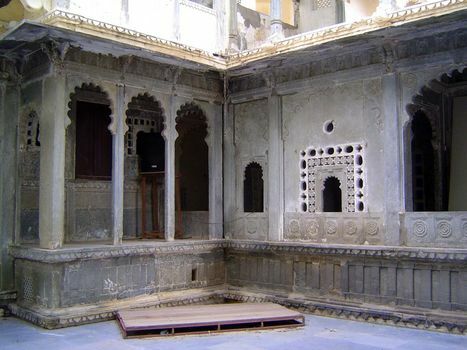 The Moti Mahal, also from the 1620s. The name means Pearl Hall, but the walls are actually clad in mirrors. 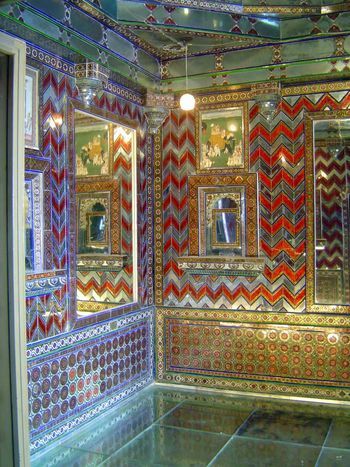 The Zenana Mahal or women's quarter, done in cafeteria green. 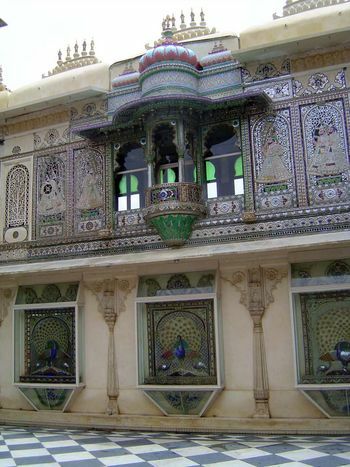 The Durbar, or Reception, area, called Mor Chowk, or Peacock Courtyard after peacocks were added about 1880. 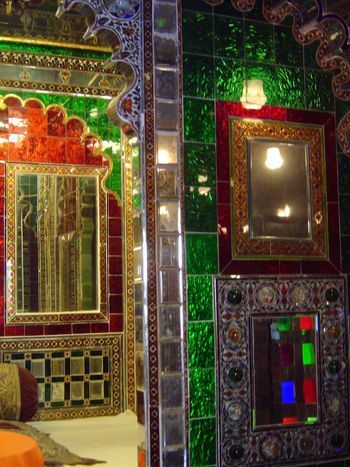 They're in mosaic, of glass from Belgium. 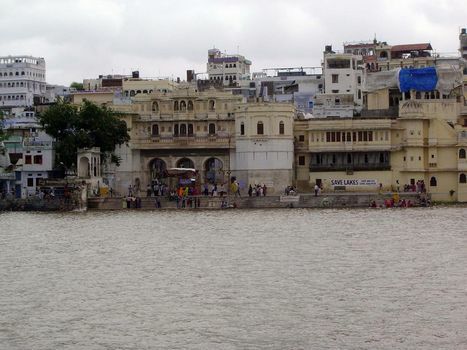 We've left the City Palace and come to the outlet of Pichola Lake. 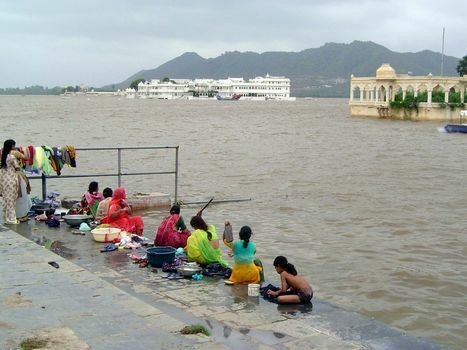 The place is Gangaur Ghat, or steps. 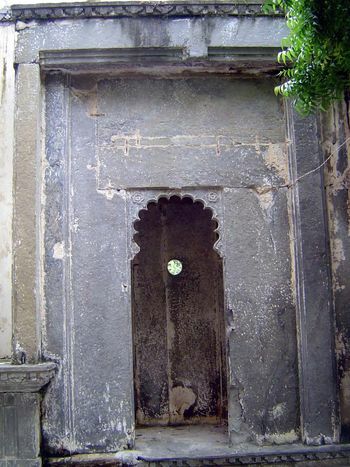 Now we've stepped back from the ghat and are seeing it through another Tripolia, added in 1878. It's the waterside entrance to another palace, off to the left. 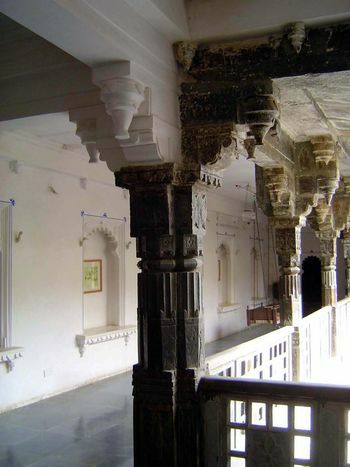 The courtyard of the Bagore ki Haveli, a mansion built by Amar Chand, the prime minister of Udaipur from 1751 to 1768. The royal family took it over a generation later. Fallen into disrepair as government offices after 1947, the building was turned over to the West Zone Cultural Centre in 1986 and has been cleaned up. 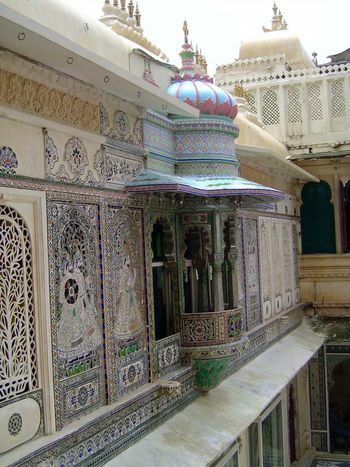 The ground-level of the most elaborate courtyard. 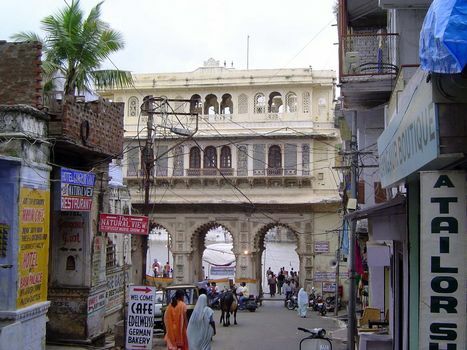 The Tripolia from the other side of the water; the haveli is at the right edge of the frame.